In a parallel universe, you have a website running on an excellent host with 99.9% uptime, fast loading speed and doesn’t cost you. Sadly, it’s not possible. It’s just a view of a utopian world. Every host has got its own flaws. No host can deem itself as the flawless. Most of the time, we end up choosing a bad whose which again ends us in frustration. And there’s no other way out of the mess than shifting to another host for your website. But even the other way out is tricky and quite annoying. You have to take care of everything and ensure that you don’t end up in some kind of problems. 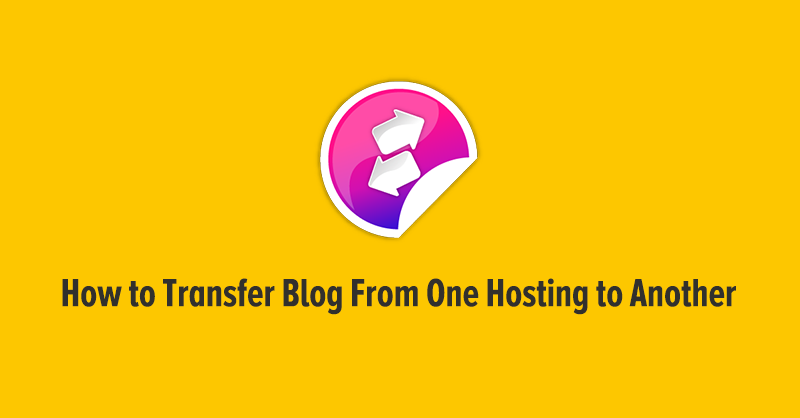 So here we are to guide you through the process of transferring your website from one host to other. First of all look at the plans of the other services, hosts to which you want to shift your website to. Make an account on the new hosting website and choose the suitable plan that satisfies your need. Meanwhile, don’t cancel your existing subscription you have with the current host. This will lead to downtime and a loss of a good amount of traffic. In the next step, you should take backups of everything present in your website. From ever piece of content to images, take a backup of everything from your old host’s server to transfer it to the new one. It’s just like shifting from one place to another—packing everything you have in your current home, transferring it to the new place, opening up there and set it up. WordPress marketplace has got several plugins which will help you take a comprehensive backup of your website. For all the images, html files and others, you can use tools like FileZilla or Smart FTP which will get your things done easily. If your website uses databases, you need to import them too; which you can easily do with the help of applications like PhpMyAdmin. Make sure you take backup of everything so that your website runs entirely fresh on the new host. The next step is obvious, upload all the files you backup-ed to the servers of your new host. Once you sign up for the new host, they would send you emails regarding every information on the servers which will help you upload your files. In case of database, first import all the plugins you have been using on the last server to the new server; and then import the databases. To associate your email-id with the new servers, you need to add up your email account with the new host before turning on the DNS. With the new details provided by the new host to sign-in, get into and add all the email accounts you have been using it on the last host’s server so that users don’t fail to contact and communicate with you. Almost all the major things have been done, it’s time to have a ride with the new website. Once you upload all the files to your new host’s server, you will get a temporary URL of a small website to check the performance of the website on new host. While checking out, do make sure that all of your images and content are intact or not. After all this, you can inform all your reads about the change in host. Moreover, you can and you should ping all the directories tour website’s link because of change in host. But to complete the whole transfer thing, you still need to update the DNS records. First of all, update all of your database strings from the control panel provided by the new host. Remember the mail you were sent by the new hosting provider? The mail would indeed contain new DNS name servers. You just have to copy these and paste it into the control panel’s name servers. You have to wait for couple of hours, it even takes a day-or-two to complete the whole process and to successfully transfer the websites. Once it is done, do have an overall look at the site so to ensure that everything is working fine.